Once the bolognese filling is ready, just spoon it into the zucchini boats and roast one more time for about 15 minutes. Then, right before serving, drizzle a bunch of pesto on top. The double whammy of basil in the sauce and the pesto makes these boats super flavorful and delicious! You can use any pesto you like (make sure there’s no cheese in it for Whole30–I’ve linked to a couple of my favorites below in the notes). 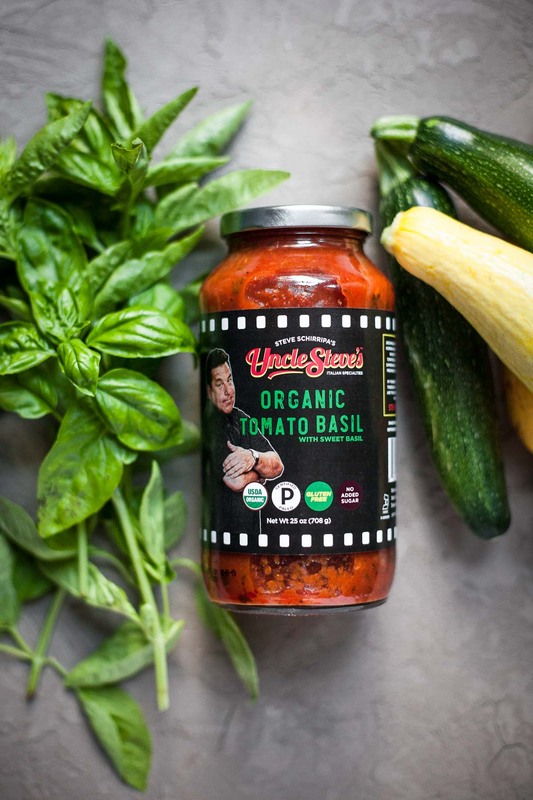 I absolutely love having Uncle Steve’s sauces on hand to add quick flavor to everyday meals, and am thrilled to have a tomato sauce option that’s organic, paleo, and vegan with no added sugar. In case you missed it, last month I shared an amazing Whole30 breakfast using their spicy arrabiata sauce. 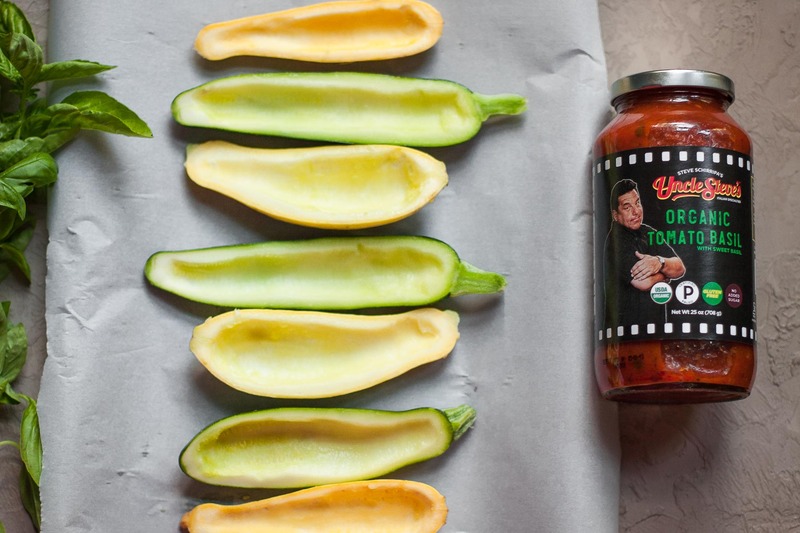 When you get a chance to try their sauces, I want to hear if you love them as much as I do! Happy summer, and happy zucchini stuffing! Heat a large skillet over medium heat. When the pan is hot, add the olive oil. Once the oil is hot, add the onion and cook, stirring occasionally, for about 10 minutes, until beginning to brown. While the onion is cooking, halve the squash lengthwise and use a spoon to scoop out the seedy pulp from the center, reserving it to use in the filling. 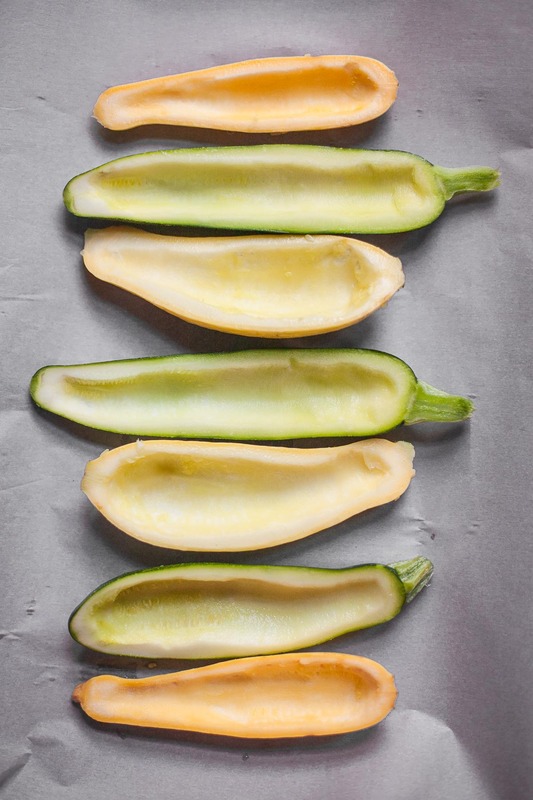 Place the hollowed out zucchini boats on the baking sheet and sprinkle with sea salt. Put them in the oven to roast while you continue to prepare the filling. Once the onion is a bit browned, push it to the edges of the skillet and raise the heat to medium-high. Add the ground beef and cook, stirring occasionally and breaking up the meat with a spatula, until no longer pink. Chop the reserved squash pulp and add it to the meat along with a few grinds of black pepper a few pinches of sea salt, the oregano, and the tomato sauce. Bring to a simmer and cook for five minutes, stirring occasionally. Taste the bolognese sauce and add salt and/or pepper if needed. Remove from the heat. Take the zucchini boats out of the oven. They should appear dry around the edges. If there is liquid in the center, carefully pour it out or blot it with paper towels. 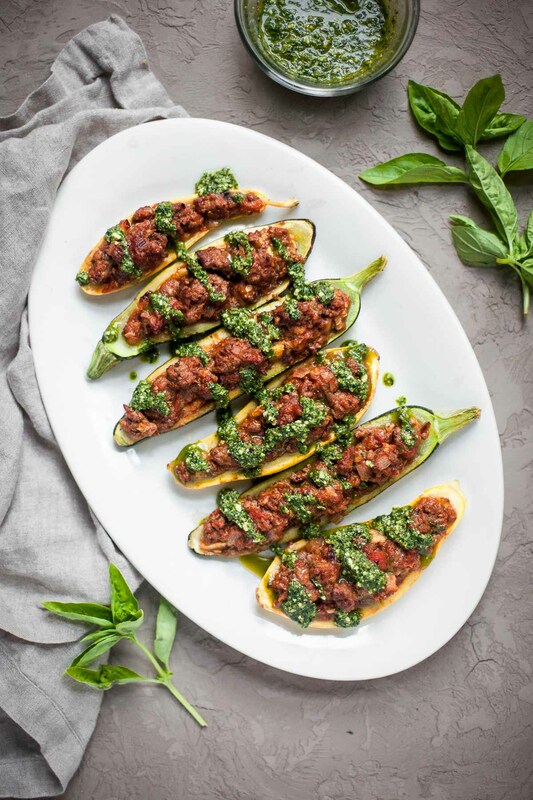 Spoon the bolognese sauce into the zucchini boats and bake for 15-20 minutes, until bubbly and browned in spots. Use a long spatula to carefully transfer the boats to plates or a serving platter. If necessary, thin out your pesto with olive oil so it's a pourable consistency. 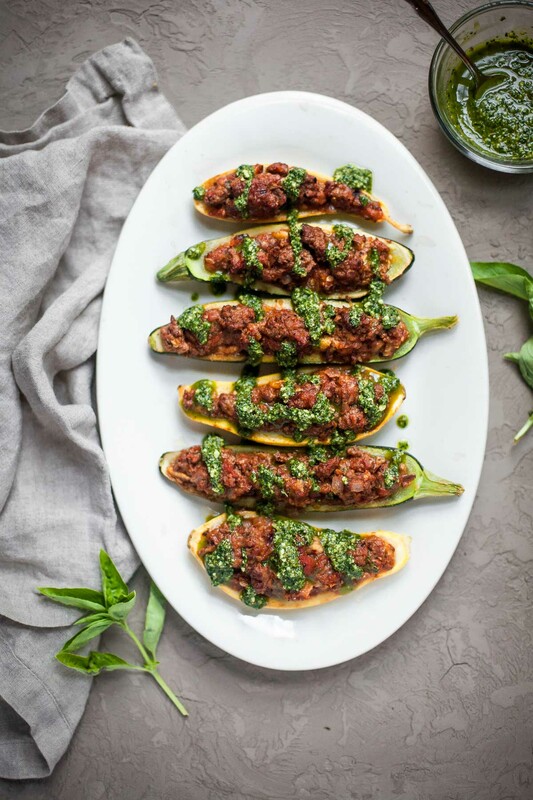 Drizzle the zucchini boats with the pesto and serve hot. Leftovers reheat well on a baking sheet covered with foil in a 350° oven. If you know you won't be eating the stuffed zucchini right away, wait to add the pesto until you're ready to eat them. *Use any dairy-free pesto to keep this recipe Whole30-compliant. I love my carrot top-kale pesto (pictured here is a version of that recipe with basil instead of carrot tops) or my everything pesto if I have a lot of different herbs on hand. This post is sponsored by Uncle Steve’s Italian Specialties. 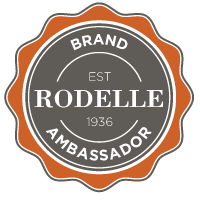 Thank you so much for supporting the sponsors that keep A Calculated Whisk up and running! I love how simple this is! I have everything in my pantry so I’m going to whip this up for dinner tonight. Hope you love it! It’s one of my favorite summer dinners. Are the zucchini firm enough to eat with your hands like a hotdog? During the summer I’m all about foods that require not silverware when bringing to picnics and potlucks. Any suggestions for appetizers or sides to take to a 4th of July party? We’ll have vegans, gluten free, and dairy free people attending. Yay, I’m so happy to hear that! If a fruit salad would work you can do the pico de gallo de frutas from Paleo Planet (page 251) with blueberries instead of kiwis–super patriotic. You could try making little skewers with it on toothpicks! This potato hummus would also be great: http://acalculatedwhisk.com/paleo-potato-hummus/. Or a salad– grapefruit and avocado salad (page 67–use maple syrup instead of honey if your vegan friends are strict) or kale salad (page 68) would be awesome. Happy 4th! Thanks, Becky! Going to try the potato hummus 🙂 Have a happy Fourth of July! All I can say is that I need to give this a whirl! These look so appetising and easy to make – always a good combination. These look so good!!! We just made a Bolognese sauce tonight, I wish I had had it in these stuffed zucchinis though. They look amazing! I always grow WAY too much zucchini. Now I know what to do with it. Yay! This is so great with fresh-picked zucchini! These pictures are stunning. Love this simple and elegant meal! I am always looking for new ways to use summer squash – thanks for this easy and tasty recipe! Love EVERYTHING about this post. Gorgeous pictures, too. Not eating tomatoes currently but totally going to make this for my family. Great recipe! Thank you so much, Jo! Sorry you can’t have tomatoes–it’s so kind of you to make it for your family anyway! I love stuffed squash recipes! Looks very tasty 🙂 Will be looking out for that sauce. This dish looks and sounds so delicious ! I’m mouthwatering just thinking about it. Saved and shared !! Thank you so much, ChihYu! Appreciate you sharing! I love zucchini! This looks like the perfect dish for entertaining! Thank you so much, Irena! Looks so simple to do and perfect to use all that squash we (hopefully) will be getting soon! Thanks, Michele! Hope your squash is ready to roll pronto! This looks so good! I love stuffed foods so much. I need to try this! Thanks, Jean! Stuffed foods really are more fun! Yum!!! This looks so delicious, my squash are still too small, but soon I’ll be overwhelmed by summer squash and I know my husband is going to be crazy about this! Thank you so much, Kari! This will be wonderful with squash from your garden! Mmm that sauce looks amazing! What a fun way to use up the garden zucchini this summer! Thank you!